George C. Whitney is the man behind all those cards marked Whitney-Made. The family-run company was in the valentine making business for 77 continuous years. During the early part of the 20th century they enjoyed a very generous share of the market due in part to George Whitney's habit of buying out his competitors. I'll be as cross as a bear if you refuse me. Whitney got his start as an employee of Esther Howland's card making enterprise before he went off to war. He was born in Westminster, Mass September 19th, 1842 and grew up in Worcester. This would explain the very similar style of his early cards to that of Esther Howland, another Worcester, Massachusetts resident. 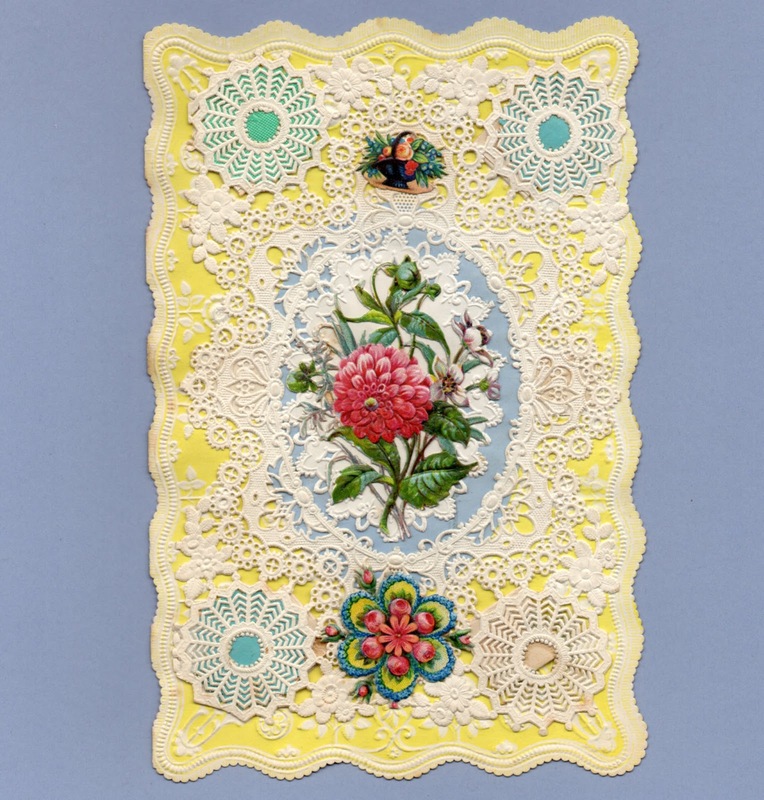 They used some of the same paper lace and scrap manufacturers too, so you will find some of the same names on those items employed by both. Even their early maker's marks were similar in style, each using their initial stamped in red ink on the back. Although you will sometimes find a blue Whitney "W."
Signing up with the 51st Regiment of Massachusetts Volunteers, Whitney went off to fight in the Civil War in 1862. 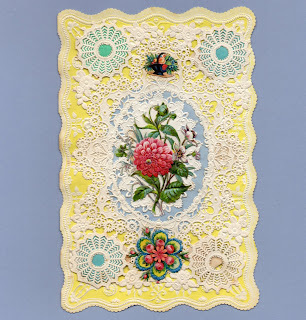 Just prior to this in 1858, his brother Sumner and his wife, Lura Clark Whitney, had begun their own valentine-making venture. Sumner was soon joined by another brother, Edward. Their business was located in Worcester, just like Howland's, and was operating as Whitney Bros. In July 1863, George was discharged from his military service and by 1864 had joined his brother's company. They were advertising themselves at this time as The Whitney Valentine Co. Sumner had passed away around 1861 and then in 1869 Edward decided to split away and devote himself instead to the wholesale paper industry. George now ran the valentine company himself but the surviving two brothers kept up close business ties, even keeping their operations located near one another. During the late part of the 19th century George had begun buying up his competitors. 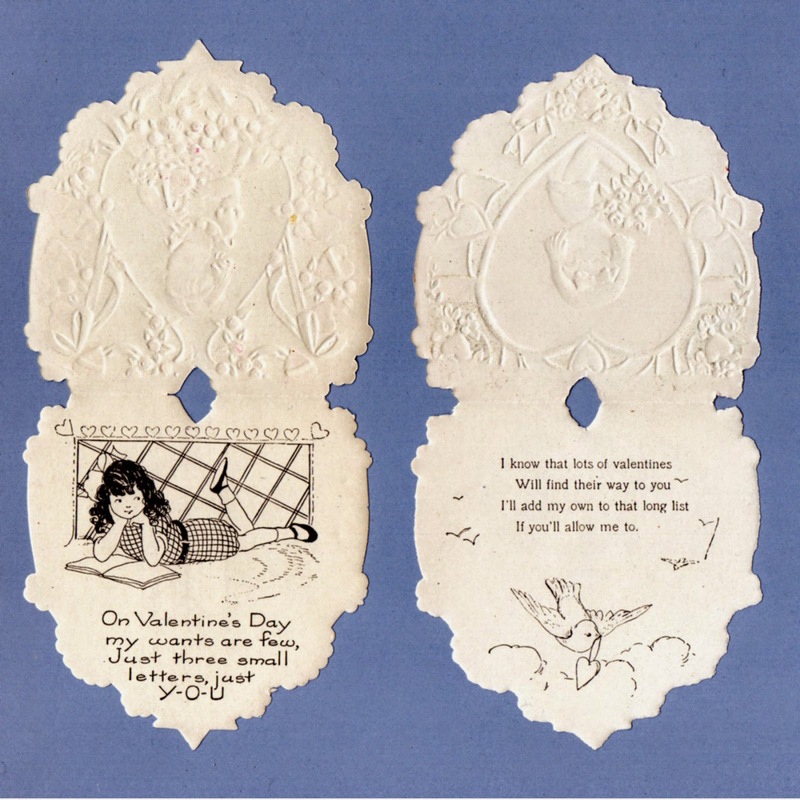 He purchased the A J Fisher Co of New York (who were making valentines as early as 1835, possibly earlier) despite not wanting all of their stock and plates as they did a brisk business in the comic style or vinegar valentines for which George did not have any appreciation or any interest in producing himself. These he is rumoured to have passed along in a deal he made with McLoughlin Bros (another New York company). Other purchases include Taft, Bullard Art Publishing Co (who also had roots in Worcester, Mass), Berlin and Jones and several others. One of his most notable purchases was that of Esther Howland's New England Valentine Company (NevCo), bought sometime between 1879 and 1881. May I ask you to be my Valentine? Looking to reduce his reliance on imported papers, Whitney installed his own embossing and paper lace making machines in 1874. Two years later he moved into creating cards for Christmas and other holidays as well as books. The company grew steadily and added more printed novelties and holidays to celebrate to its roster of goods. By the first decade of the twentieth century Whitney had grown to a large and prosperous company. 4 x Cards - Typical of Whitney's Single Fold Cards. each measures about 2 7/8" x 3 7/8"
Then came the fire. January 12th, 1910 brought a very spectacular fire that swept through their Union Street building very quickly. It drew large crowds as dramatic explosions spewed up copious amounts of flaming greeting cards. Despite this devastating loss, the company was able to carry on as they had already shipped out their valentine cards for that season. They rebuilt, bigger and better, but George passed away not long after, on April 1st, 1915. With son Warren A. Whitney now in charge, the company found themselves facing the 1920s with much more serious competition from other growing American companies like Carrington, Rust Craft, Gibson, Buzza, Hall Brothers, and American Greetings. The market had changed too. In the years past, Whitney's prices had ranged from $1 to a high around $50. 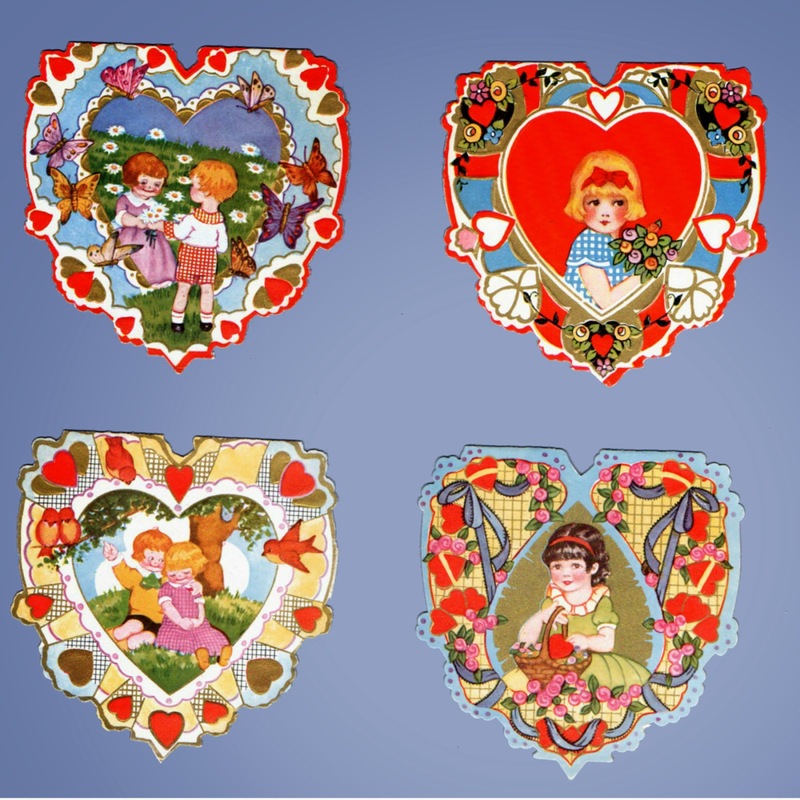 Now valentines were sold primarily to young school children with Whitney's most expensive offering well below their old high at under $5. The styles of the cards they offered remained much the same from the 1920s into the 1930s, right up to their closure on February 27th, 1942. Warren was forced to liquidate the company largely due to paper shortages brought on by World War II. Chicago's Carrington Co bought their presses and stock, but older plates had been lost in the 1910 fire and many later ones had been discarded along the way. 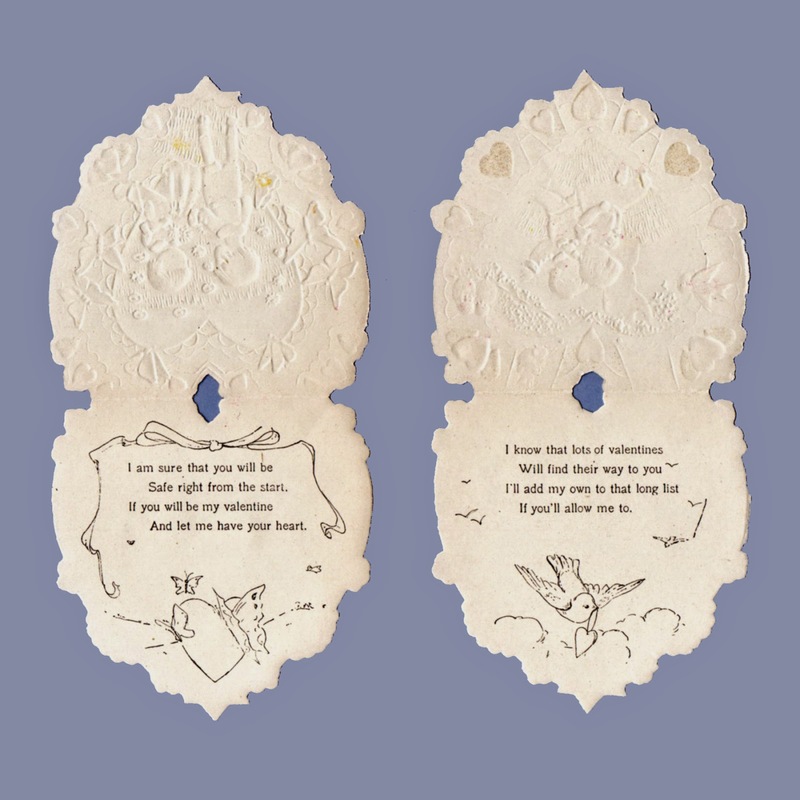 Heart Shaped Cards (see images for messages on them). 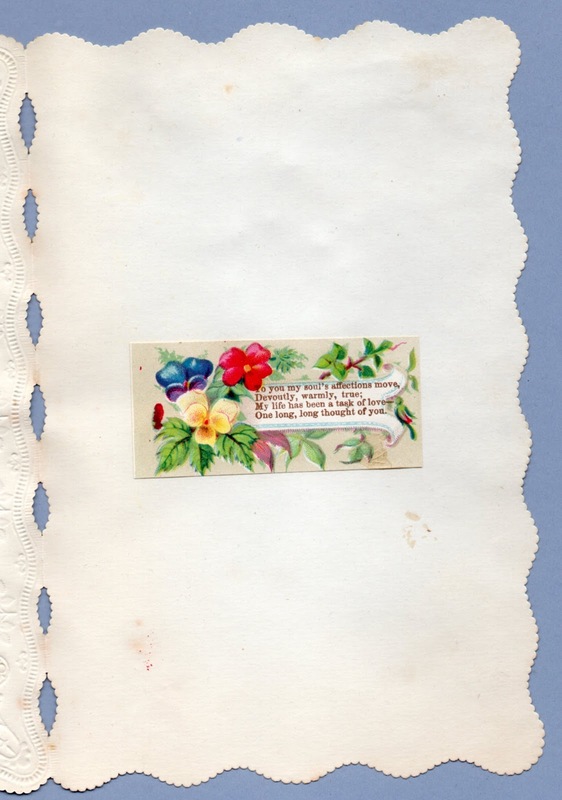 each measures about 3 1/4" x 3 1/4"
To you my soul's affections move, Devoutly, warmly, true; My life has been a task of love - One long, long thought of you. Thank you again for an interesting and informative post! in your experience are all Whitney cards marked? I was wondering maybe boxed sets weren't? any idea? Hi Vintage Recycling! I have a box of "Whitney's Valentine Material" - a boxed kit for making paper lace valentines from 1923 - that has their logo and name on the box exterior. However the completed cards do not have the logos on their backs. These 'kit' cards are not the same simple folder that is their most common card style, but the images used are very much theirs. So I would say there are probably a few unmarked cards in their art deco style, but they may be largely the cards included with and/or made from materials included in these 'kit' type valentines rather their classic art deco folder type. 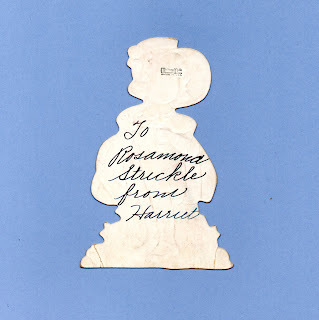 There may also be some of the very early romantic style (like Howland's) that are unmarked. There are some unmarked Howland cards, so any unmarked Whitney's from that time could be hard to distinguish from hers. Its possible there were other types of boxed sets that contained unmarked cards, but I have not come across any boxed sets of Whitney cards other than these 'kits'. I'm glad to hear you are pleased. This entry will, over time, become more fleshed out with additional images of cards and with any new info I come across that is pertinent. You have a family history to be proud of for sure, with its rich contribution to popular culture. I have not yet been able to find information regarding the artists who worked for Whitney. That is something I would really like to add to this entry. The card you mention in particular is very similar to some of the work by Mary Hays Huber (aka Mary A. Hays). 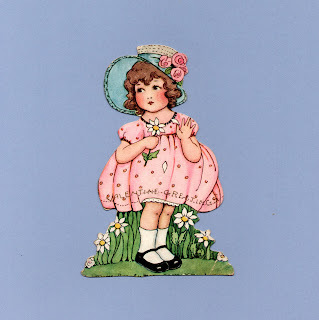 She is the niece of Grace Drayton (for whom we have an entry) and the daughter of Margaret Gebbie Hays who is also a children's book illustrator and the creator of many cards and valentines. Now, I cannot say for sure that this is her work, but there is great similarity. I am working on entries for both Mary Huber and her mother Margaret. Thoroughly enjoyed reading the above account of the Whitney Valentine Company. I was born in Worcester, but never realized what a wonderful history the city has.